Roger and Nicki Beattie along with their family, continue to raise the bar on both product standards and organic and natural farming practises. To see the multiple projects they are constantly working on click the photos below. 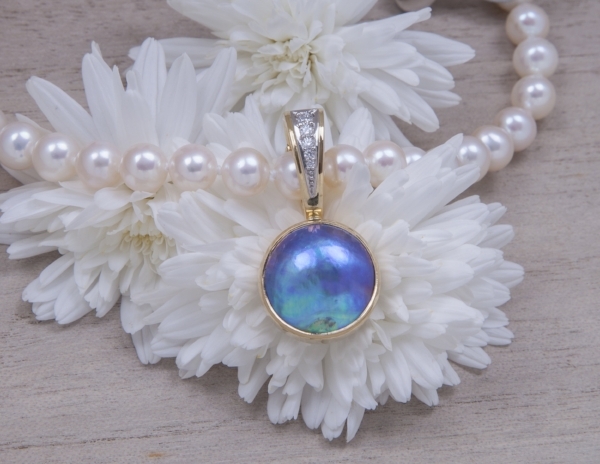 The Blue Pearl story is one of dedication and commitment through years of research and development to create a gem that is truly distinctive, truly one of a kind. It’s a story of the vision of Roger Beattie who, in 1989, established the first ocean based blue pearl farm at Whangamoe Inlet on New Zealand’s Chatham Islands. His understanding of the pearl fishery and his empathy, not only for the environment but also the very rhythms of nature’s life cycles, led Roger and his team to embark on a project which would see the creation of a new gem, unparalleled in its beauty and colour. Roger established Eyris Blue Pearls in 1999 to develop the sales and marketing of the sea-based abalone aquaculture and blue pearl production. 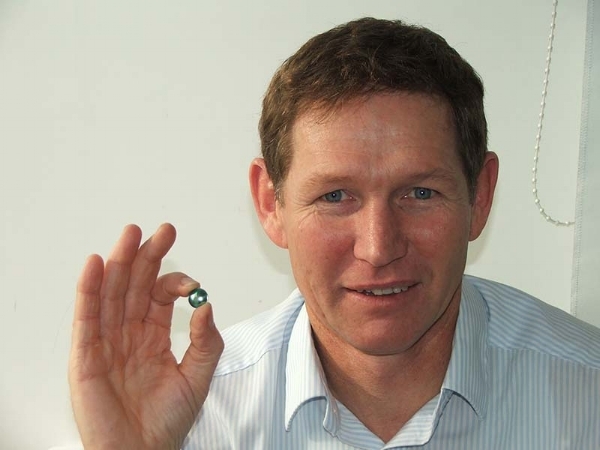 Eyris Blue Pearls has achieved international recognition, sales within the pearl community and continues to expand its supply of this uniquely beautiful New Zealand product, to a wider market. NZ Kelp began with food grade kelp which is now under the Valére brand. Once their access to harvesting (using the Quota Management System) increased, they branched into kelp for agricultural and horticultural use, sold under the brand Zelp. Valére Kelp Pepper began when the Beattie family used it dried and flaked onto fish at BBQs on the beach. They discovered it was really tasty and enhanced the flavour of the fish. They then cracked it into smaller pieces and used it at home, where it sat on the family dining table and was shaken onto meals. One morning their 4 year old son said a simple phrase and a new name was coined. "can you pass the 'kelp pepper' please"
The Beatties unique method of drying the kelp to retain its colour, goodness and flavour has changed little since that time. Kelp has been eaten by man for centuries and forms a major part of many people's diet. It is also taken as a health product. Wool in it's simplest form, from the heart of New Zealand. Pilana works with nature to provide wool as nature intended. Using human ingenuity we have created ways to use these natural fibres, rather than altering them to meet the needs of production. We find value in taking the time to get everything right without cutting corners or compromising quality and integrity along the way. Our farming practice allows for our sheep to enjoy life. Pihepe’s are pasture grazed; receive no chemical treatment or antibiotics in their lifetime and are shorn once a year to keep them warm through the winter months. In production we have taken the time to select natural, synergistic fibres that complement Pihepe wool and create yarn, that when blended, is far greater than its individual parts. We use slow manufacturing to meet the needs of the fibres, carefully creating each yarn for your use. Our Pihepe sheep are fully certified organic to USDA NOP standard and run free across the rugged, rolling country at Lucas Bay on Banks Peninsula. Our 'Beyond Organics' animal welfare allows our sheep to enjoy life. Weka, or Woodhen is a flightless native bird, endemic to New Zealand. In the wild Weka normally have one to two clutches of 1-4 chicks per year. Juvenile Weka are sexually mature at about four to six months old. Mature females weigh between 500 – 850g and mature males weigh between 700 – 1200g. Weka are omnivorous, they have a preference for insects, but will eat fruit. Weka are highly territorial and parents chase away offspring from their territory at about four months. The Weka were a favourite food of Maori and the colonial explorer Brunner described them as being 'better than chicken'. We should be known as 'Weka' because they are closer to our psyche than Kiwi. They are cheeky, outgoing and vivacious. Weka have special significance for people of the Chatham Islands. Chatham Islanders call themselves 'Weka's in the same way that New Zealanders call themselves 'Kiwis'. Eastern Buff Weka, (Gallirallus australis hectori) were taken to the Chatham Islands in 1905 from Canterbury. They died out on the Eastern Coast of the South Island by the 1930’s. Weka have done well at the Chathams because there are no stoats, weasels or ferrets. They can legally be hunted on the Chathams. Also, DOC has a policy of exterminating them from nature reserves. Roger Beattie spent 17 years at the Chathams often involved with conservation. Weka were a constant companion from the thick bush to the shore. You can’t live on the Chathams and not have empathy for the Weka. Roger and Nick Beattie left the Chathams in 1992 and bought a farm on Banks Peninsula. They could see an opportunity to use Kowhai Vale as a base for re-introducing the Eastern Buff Weka to Canterbury. Roger figured that because DOC were killing them on the Chathams as an ‘introduced pest’, and also because Weka were native to Canterbury, that it would be simple. How wrong he was. Geordie Murman, who had worked for the Wildlife Service on many of New Zealand’s offshore islands, sowed the seeds in Roger’s mind of a large predator-proof reserve. Soon after DOC was set up in 1987 Geordie suggested they build a predator-proof reserve for the Taiko on the south coast of Chatham Island. DOC wouldn’t do it. It was too radical and unproven. There have been several attempts over the years to re-introduce the Weka back onto the East Coast of the South Island. They were all unsuccessful, largely due to predation. In 1994 the Kowhai Vale predator-proof reserve became the site of the first successful Weka re-introduction. 50 acres at Kowhai Vale were fenced off in 1993 especially for re-introducing Eastern Buff Weka. At the time this was the first of its type and largest predator-proof reserve on mainland New Zealand. The fence took six months to construct. Permits from DOC to ‘transfer’ 8 birds and ‘hold’ this endangered species, were granted after a 14 month application process. 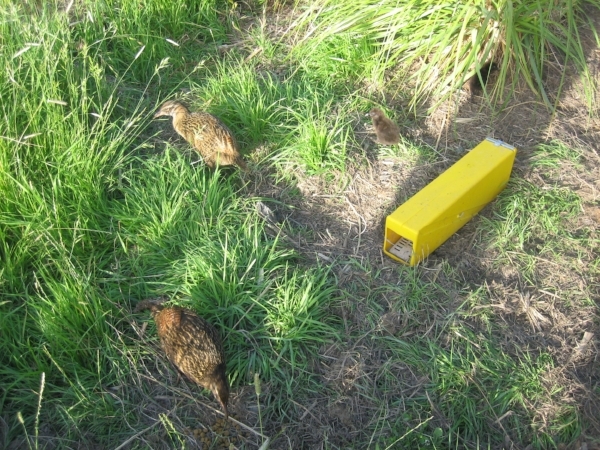 The formal opening of the Kowhai Vale predator-proof reserve was on 23rd of April 1994 and marked by the release of the 8 Weka into the reserve. Around 100 people were invited, that created an inspiring sense that the innovative Kowhai Vale predator-proof reserve was a turning point in conservation. As with all new ventures there was a rapid learning curve. The Weka settled in and seemed quite at home. Then EUREKA! The Weka were breeding. At least three chicks were hatched and raised in quick succession during October 1994 to early winter 1995. This was amazing – it almost seemed too easy. As it turned out the risks to the fence had been underestimated. The terrain was steep and rocky. If Roger and Nicki could make the Kowhai Vale predator proof reserve work, they could also work anywhere. Towards the end of 1994 a large rock rolled down the hill and put a hole in the fence. Fortuitously a male and a female survived and within six months the numbers had built back up to eight. If nothing else, it is clear that if predators could be kept away, Weka breed like crazy. The problem now was that without some new birds, there would end up to be a seriously in-bred population. In March 1995, 10 new Weka were brought in from the Chathams under another transfer permit. Again the Weka settled in quickly, started breeding and by August 1995 there was a total of 15 Weka including a new chick. Then another set back. In early 1996 a cattle beast kicked a hole in the fence allowing a stoat to get in and wipe out most of the birds. It just killed and left them! 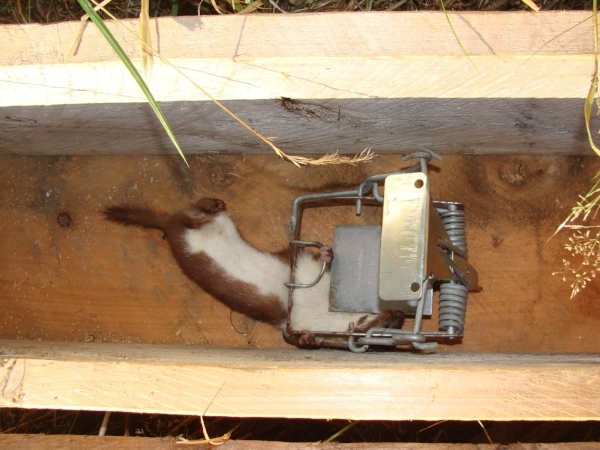 Traps were laid and a single large stoat was caught. The fencing base was strengthened by putting a stronger mesh around the base. Nature now dealt another blow. 1996 was a particularly wet winter and in late August a landslip took out one corner of the reserve. There was no evidence to suggest that any Weka were left in the reserve. There was still hope that some had survived and were lying low. Meantime, with a digger and new fencing materials, they began to repair the damage and get in some more Weka. On the 24th September 1998 we put in our third application for a transfer permit. After almost 2 years, DOC gave over conditional permits to transfer and hold 16 Weka from the Chathams. The 8 Weka that were brought over and seized under these permits, had been so stressed by excessive handling that several died within a short period of being released into the predator-proof reserve. “We were able to maintain numbers with the survivors but we didn’t get the build up in population we were hoping for”. This conservation project discovered that the dominant male and female Weka would kill off their offspring once they became sexually mature at about four months. To give offspring a chance, sub-compartments within the predator-proof reserve were set up. Once these were ready, the permit for the other 8 Weka had expired. Once again, another application was prepared and submitted in November 2001. From the time of the first predator-proof fence in 1993 ideas around the material and construction regarding predator-proof reserves had steadily improved. Although the reserve at Kowhai Vale remains the corner-stone of Roger Beatties’ Weka re-introduction operation and is a lesson in native habitat restoration in its own right, Roger is the first to recognize that it has limitations as regards building up the Weka populations. The highly territorial nature of Weka makes survival of juveniles problematic even in the absence of predators. “We are now building more efficient, less expensive structures and have now shifted our focus to smaller areas (about one-tenth of a hectare) in which we have a breeding pair. We shift their offspring at about three months when they become sexually mature to avoid parents killing the offspring. It is remarkable how on a small budget and doing things on a part time basis there has been so much achieved. Roger has supplied over 200 Weka to organisations and groups such as Willowbank Reserve, the Kiwi and Birdlife Park in Queenstown, Ngai Tahu and Motatapu Station; the largest private conservation program in New Zealand. Keeping Weka requires a permit to hold and a permit to transfer. We can help! The latest of Roger and Nicki's ventures but one that has been in the pipeline for nearly 40 years. Wyld is a culmination of many things and has strong philosophies that stay true to Roger and Nicki Beattie. The name Wyld was chosen to reflect the link between the Pihepe and the Bohepe's survival through Natural Selection and what man naturally selects in order to thrive. Wyld garments mimic the natural fleeces of the Pihepe and Bohepe, which endure extreme conditions in the wild. These woollen garments allow you to adapt to your environment in the same way the sheep’s wool is able to adapt to its environment. Our cosywear creates a new appreciation of comfort that stretches the boundaries of wool and how you wear it. Become blissfully unaware of what you are wearing, whilst feeling just right. Our Pilana, natural comfort blend of 50% Pihepe, 25% Bohepe and 25% Possum have been selected to complement each other and to create a yarn that when blended, is greater than its individual parts. Organically grown and ethically treated these Rams are stunning animals. Sure footed and agile, they easily live on the rugged hills of Banks Peninsula. The Whaling Station property at Fisherman's Bay has been the Beattie family holiday home for 18 years. The property is "...truly a piece of paradise...". The situation is secluded, private, peaceful and tranquil. It lies on the edge of whatever mother nature throws. Sunny hot days are a water lovers dream. This 1.56ha (3 acre) block is on the Fisherman's Bay on the southern side of Arapawa Island immediately adjacent to the old whaling station breastwork and structures (now part of a Department of Conservation reserve). The property overlooks Tory Channel - the gateway to Picton for the interisland ferry services. There are uninterrupted views across Tory Channel to the Cook Strait and the hills of south west Wellington. Paper road reserves on the island allow opportunity for exploring further afield on foot. Situated immediately behind the sandy beach and only a stones throw away from the water. It has a good entrance lobby area, 3 bedrooms, open plan living, dining and kitchen. Bathroom and separate toilet, laundry, double sliding doors off the main lounge open out onto both the front and rear decks. PER NIGHT rates are for a maximum of 5 occupants. Additional guests can be accommodated at the rate of $15 per person. The second bach is approximately 70 metres from the beach. It has two bedrooms, open plan kitchen and dining with a separate living area. Bathroom, toilet and laundry are combined. Fisherman's Bay has historical significance - early last century a whaling station was established and became the basis of a small community for more than 30 whalers and their families. Today the waters host a huge variety of fish and seafood - Blue Cod, Maori Chief, Moki, Butter Fish, Terakihi, Paua, Crayfish and Kina. There is great fishing off the whaling station breastwork, in Tory Channel and just outside the heads in Cook Strait. "...truly a piece of paradise..."
Eyris Blue Pearls is a division of Sea Right Investments of which Roger is the Managing Director. As well as being half of the R & N Beattie Farming Partnership, Roger is also joint Director of NZ Kelp, alongside his wife Nicki. 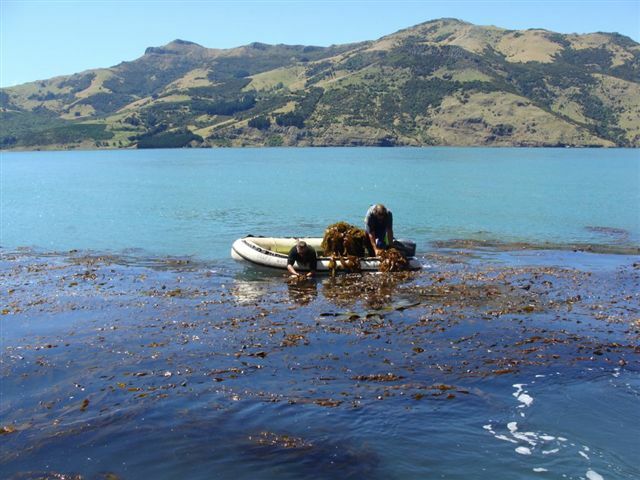 Having established his fishing and fisheries investment company on diving paua and sea urchin, Roger has since expanded the scope of Sea Right Investments Ltd into comprehensive quota management and aquaculture processing and export. Roger has enjoyed presenting internationally on property rights, economics, the environment, branding & marketing, and European fisheries management. Sea Right Investments is at the forefront of the move within the whole of the New Zealand fishing Industry, away from expensive government administration of fish stocks towards cost effective industry management of improving fisheries. Roger recently joined the New Zealand Seafood Industry conference, delivering a presentation titled "20 years... Wasted Resources and Missed Opportunities."